It has happened to us all: you’re in a storyboard, you’re using the Assistant Editor, you want to control-drag from a button into your code and create an action. But sadly you forget to select “Action” from the drop down menu and instead create an outlet. Yikes! 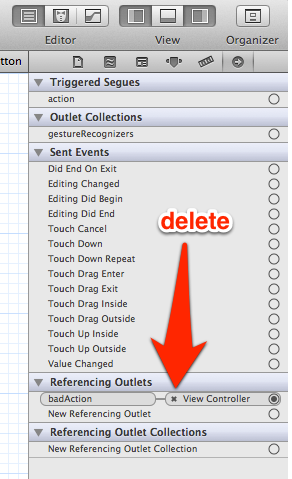 Unless you’re using Version Control, there is no way to undo adding that bad outlet. So you ask yourself: Will I have to start from scratch, or is there a way to fix your app? Once you’re done, run the app again and all should be fine. To display the storyboard in the visual editor again, just control-click the file file again, and select “Open as – Interface Builder, iOS Storyboard”. Hi Dajrone, it’s difficult to diagnose without seeing more of your code. One of the reasons this can happen is when you set a property on an instance that doesn’t have it; for example, say you’ve written a subclass with a property, but you’re accidentally instantiating its parent class and try to set that property. To hunt down where the problem happens, set an exception breakpoint and see where Xcode stops your code. i am using storyboard and when i tap on the profile button my app crashes only on 4s device. Hi Yash, those things are tricky to find. It may be something in your storyboard rather than your code. Have you tried setting an exception breakpoint? Those will sometimes stop your app at the line of code that’s upsetting Xcode. That’s all I can suggest.